Recommended range: The maximum distance between the lock and the rim is not more than 23cm. 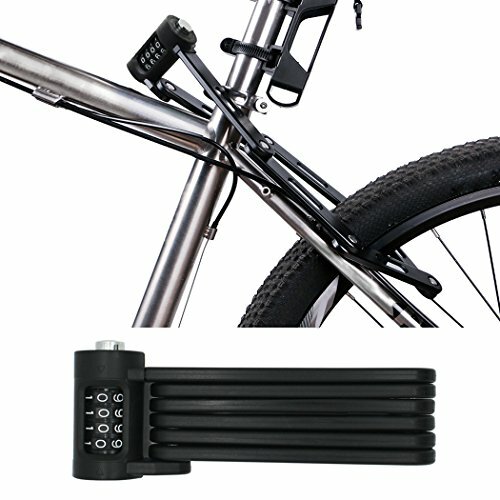 1, Ultra Strong Folding Bike Lock: 6 joints heavy duty steel bars. Features resilient 5mm steel bars that are linked with special rivets for easy folding. Safe, Lightweight, Compact, and Flexible. 2, Anti-Theft Upgrade: Made with hardened alloy steel and heating processed bike lock body, anti hydraulic clamp, anti-sawing, anti-drilling, anti-rust, covered by ABS rubber material, won't scratch your bicycle. 3, Password Lock- The keyless combination lock is easy to set and use. Set a combination that you won't forget from 10,000 possible combinations. 4, Easy to Carry and Store: The Foldable design that largely increase the lock space (210mm*400mm) within the smallest lock size(65mm*185mm). You can fix it on the bike when you not use. Supplied with bike mounting holder and fixings. 5, Application: Long Steel Bar. Can lock two bikes in the same time. Good for Mountain Bike/MTB, Cycling/Bike, Folding Bike, Recreational Cycling, Fixed Gear Bike, Others, BMX, Road Bike. It can also be used on motorcycle. If you have any questions about this product by FLYDEER, contact us by completing and submitting the form below. If you are looking for a specif part number, please include it with your message.